According to the National Geographic Channel, the average person takes about 28,000 showers in their lifetime. As you age, it becomes more difficult to enjoy this everyday luxury. That’s why a hand wand shower head (also known as a handheld shower head) is a great idea for bathrooms. These handheld units attach to a shower wall via a long rubber hose and can be easily removed to direct the water where you want it to go. Hand wand shower heads offer better control. This is especially helpful for seniors or those who are taking care of seniors. “Most handheld models feature a hose that ranges from 3 to 6 feet...or more,” according to HowStuffWorks. “The long hose...on these shower heads makes them a convenient option for people who use a shower seat to cope with injury, arthritis, or other physical limitations. They’re easy to install. Despite common misconception, handheld shower heads are super easy to install. You don’t need extensive demolition, bathroom remodeling, or refinishing to install this bathroom fixture. However, if you need a little help, the plumbing professionals at Warner Service would be happy to help install a hand wand shower head. It’s an effective way to clean the shower. When you’re a senior or taking care of a senior, cleaning is a bigger chore than it used to be. Handheld shower heads make it easy to clean the shower after scrubbing with an eco-friendly cleaning or drainage product. No more filling up and hauling cups or buckets of warm water from the sink or tub. Just grab the shower head and rinse the walls and tub for a clean finish. Handheld shower heads also make it easy to keep the shower clean between deep scrubs. Rinse soap scum after washing up to reduce mold and mildew and restore tile and grout. Hand wand shower heads keep water bills low. After retirement, it’s rare that seniors are making a weekly paycheck. To keep retirement funds on track, it’s imperative to keep energy and water bills in check. Hand wand shower heads keep water bills lower compared to other shower heads. 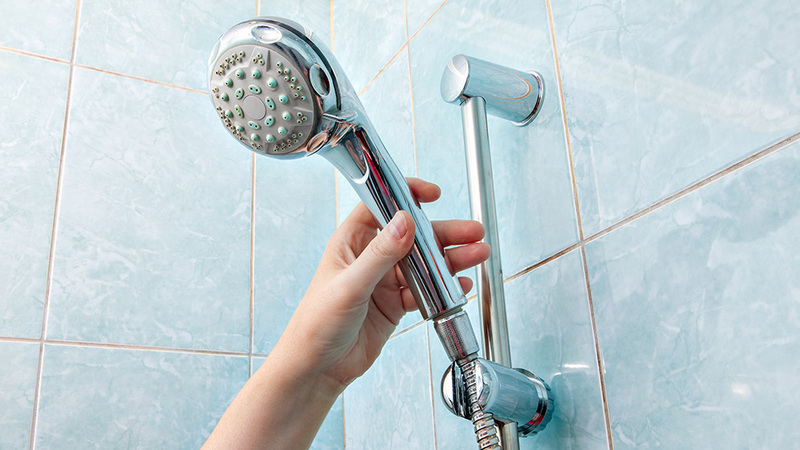 Most bathroom fixture manufacturers offer low-flow shower heads and/or special aerators. These aerators add air to the water spray to increase pressure while using less water. Choose one rated at 2 GPM (gallons per minute) or less to save 2,300 gallons of water a year. That equals a lot of savings on your water bill. This is ideal for sitting in the shower or walk-in tub, because the height of the shower can be changed to accommodate the person in it. It also allows the shower head holder to be low enough to access it from a sitting position. Handheld/hand wash shower heads have so many benefits for seniors and those taking care of them. In fact, it’s one of the many ways to make home life easier for those living in place.